In my last blog, I provided the recommended configurations that should be in place in order to support advanced Windows security features. This blog provides the task sequence details on how to convert machines from BIOS to UEFI mode. Download the BIOS Configuration Utility (v4.0.25.1 is the current version at the time of this writing) from the HP Client Management Solutions page and install it on the HP workstation system. Make a folder for the HP_Bios_Config package in your package source share (for example: \\SCCM\Package_Source\HP\BIOS Configuration Utility\4.0.25.1). Install the HP BIOS Configuration Utility on a HP system. Find the install folder on the PC and copy the contents of the installation directory to the Package share. On an x86 systems, the default install location is C:\Program Files\Hewlett-Packard\BIOS Configuration Utility. In SCCM create a traditional package containing source files without a program. Configure the BIOS on an HP workstation with the recommended settings from our blog – part 1. You will want to export a config for each model you want to convert. Copy the HP9840.txt config file to the HP_Bios_Config package source folder and update the distribution points. Modify a task sequence to configure the HP BIOS. Add a Restart computer task. Be sure to select the boot image assigned to this task sequence. 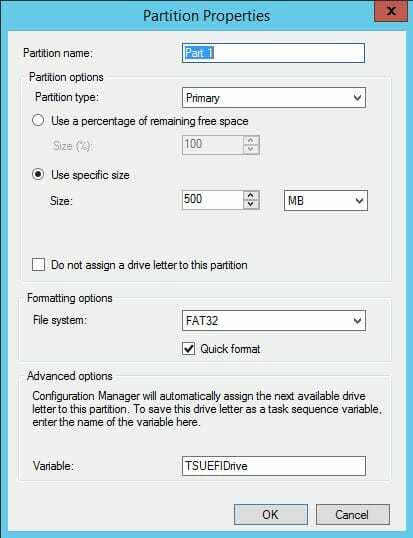 Converting HP machines from BIOS compatibility mode to UEFI can be programmatically accomplished with SCCM task sequences, which allows you to deploy the most secure Windows 10 environment possible. Need more information or assistance? Email info@peters.com. We are happy to help.